This elegant Victorian home offers an open floor plan perfect for today's relaxed family atmosphere. The first floor accommodates large formal and informal areas for easy entertaining. A large living room with fireplace is surrounded by a wraparound, octagonal veranda, and the large kitchen with center island counter opens to the sun room with ventilating skylight. 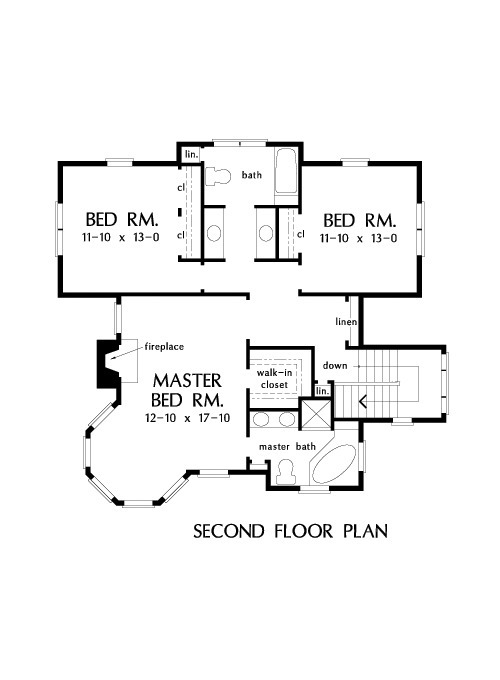 The master bedroom suite had its own fireplace, large bay/study area, and a luxurious bath. Two other family bedrooms share a large bath with dual sinks. 2nd Floor: 1074 Sq. Ft.
1st Floor: 1276 Sq. Ft.
House Dimensions: 43' 0" x 51' 10"
Great Room: 13' 8" x 13' 0"
Porch - Front : 41' 0" x 6' 0" x 0' 0"
Foyer : 5' 2" x 7' 0" x 10' 0"
Dining Room : 13' 4" x 13' 0" x 10' 0"
Great Room : 13' 8" x 13' 0" x 10' 0"
Utility Room : 7' 2" x 8' 8" x 10' 0"
Master Bedroom : 13' 0" x 18' 0" x 10' 0"
Bedroom #1 : 12' 0" x 13' 0" x 10' 0"
Bedroom #2 : 12' 0" x 13' 0" x 10' 0"
Porch - Left : 12' 2" x 6' 0" x 0' 0"
Porch - Right : 12' 2" x 6' 0" x 0' 0"
Deck / Patio : 25' 0" x 11' 10" x 0' 0"
Living Room : 15' 0" x 18' 0" x 10' 0"